Update, January 6: The first semi-final at the Smite World Championship has just finished, and there’s been something of an upset. The two-time Smite World Champions, NRG Gaming, have lost their semi-final against Team Rival. 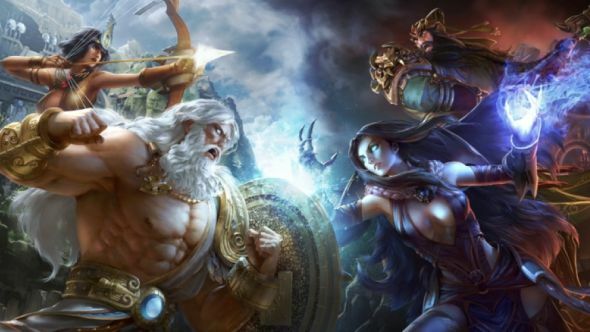 Here’s what we know about Cerberus, the next god coming to Smite. Having taken the first two games, Team Rival were in a very healthy position going into the third game of the best of five series. But a strong comeback from NRG and some overly aggressive play from Rival saw the European top seed lose the next two games, taking the series to a fifth and final game. In that game, Rival got off to a great start taking the first two kills, but NRG answered back, taking the score to 2-3. Rival gained the front foot again, however, and were able to push all the way to NRG’s Phoenix in just 17 minutes. That put the previous champons on the back foot for the rest of the game, and Rival were able to take game five’s first and only Fire Giant before claiming control of the entire map, and felling NRG’s Titan to advance to the final. There, they’ll face the winner of the second semi-final, which is about to decided between Obey and EUnited. Original story, January 6:The two-time Smite world champions are currently facing defeat in the semi-finals. NRG Gaming have lost their first two games in a best-of-five series against Rivals Gaming at the Smite World Championships at Hi-Rez Expo. NRG won the World Championships in both 2016 and 2017, and had a strong shot at winning for a third year in a row. After beating crowd-favourites Luminosity Gaming in the quarter-finals yesterday, NRG were widely tipped to calim the title for the third year running. However, for the semi-final they drew Team Rival, the number one seed from Europe. Despite the tough draw, NRG had seemed confident in the run up to the match, but lost the first game, in no small part to KaLas’ unconventional Ares pick, which worked perfectly with IceIceBaby’s Odin to cut NRG off throughout teamfights. In game two, NRG spent a decent chunk of the game in the lead, taking the Fire Giant and pushing to Rival’s phoenix, but the top seed managed to hold before pushing back. They turned around multiple teamfights from a significant disadvantage, before pushing for the win. The third game is starting right now, and you can watch it on Hi-Rez’s Twitch channel.